This is so unapologetically good, you can’t help admire the punter. Jealousy shouldn’t even feature into the equation. Those tuning into Football Focus today would have observed a panel just as flustered as those attending Carrow Road this afternoon, as a powercut 10 minutes from time led to a delay in proceedings between Norwich City and Derby County. At the time of the fault, the Canaries were leading the visitors 3-2 to keep pace with Leeds at the top of the Championship. The two teams were led down the tunnel to await the lights to come back on, with most probably expecting a procession to see the home side keep the score-line to bag the three points. Frank Lampard’s Rams had something very different in mind however, and four minutes after the match resumed, Florian Jozefzoon bagged the equalizer in ’87 before Jack Marriot caused absolute scenes for the visitors with a last gasp winner, stunning hosts Norwich and most football fans keeping track of the score. One punter – hereby nicknamed Nostradamus – however had righteously taken the p*ss by grabbing full advantage of the unfortunate interruption. Having placed a £4 accumulator that included backing Cardiff against Leicester, Brighton to beat Everton, Wolves to beat Spurs (at Wembley! ), Hull to beat Championship leaders Leeds United, and a draw between West Bromwich Albion and Sheffield Wednesday and astonishingly seeing all of them come in, the lucky mug just needed to see Norwich secure the win. At 3-2 it seemed that the person was quids in, before the match was agonizingly interrupted. 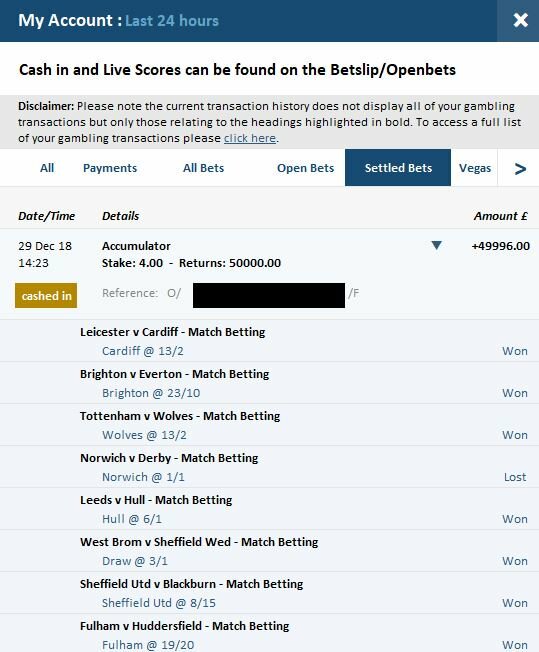 Seizing the opportunity, the punter cashed out for £50,000 (!) and must have laughed themselves silly at seeing the final result, when they could have ultimately been left with diddly-squat. Someone’s certainly on the lash tonight! You can check out the bet below! The greatest Cash In ever?